Taraji P Henson who portrays the overly dramatic and very fascinating ex-convict Cookie Lyon in television musical drama series ‘Empire’, never fails to keep viewers glued to the screen with her ever blooming on-screen personality. Taraji’s love for the arts and entertainment started at a very young age. The talented actress who righteously stayed true to her dreams has her steadfastness, skills, and determination to thank for her enviable status of today. Surrounding Taraji is a very inspiring story which can be of great help to up and coming actors and actresses in the industry. Here are lesser known facts about the outstanding actress. The actress was born Taraji Penda Henson on September 11, 1970, in Washington DC to her parents Bernice and Boris Lawrence Henson. When she was only two, her father, a metal fabricator and her mother, a corporate manager got divorced although this never changed the way they both loved her. Being the only child of her parents and seeing how her father struggled for his daily bread after he was laid off motivated Henson to work very hard. Wanting to pursue her dreams, she tried enrolling at Duke Ellington School for the Arts but was turned down. She then attended Oxon Hill High School and graduated in 1988. Moving on to study Engineering at the North Carolina Agricultural and Technical State University, she didn’t do well in her pre-calculus and so, left the school and transferred to Howard University to study theatre. To ensure her continued stay in school, she took different jobs to pay her fees. Her impressive performance at Howard later earned her Triple Treat Scholarship. Taraji later graduated with a degree in Fine Arts. Venturing fully into her dream career, Taraji P Henson made her debut in the TV show Smart Guy’ in 1997. Her interesting appearance earned her more roles and she featured in major series like ER, Sister Sister, CSI, and many others before she landed a major role in the comedy Baby Boy (2001). In 2005, she starred alongside Terrence Howard in the movie Hustle & Flow which got Academy nominations and an award. She also sang in the film’s song titled ‘It’s Hard Out Here for a Pimp’. For her contribution in the movie, she also got nods at the ‘NAACP Image Awards’, ‘MTV Movie Awards’, ‘Screen Actors Guild Awards, and many other platforms, shooting her brand to prominence. Taraji kept on featuring in more blockbuster movies and in 2011, she landed a role as Tiffany Rubin in Taken from Me: The Tiffany Rubin Story. Another major role followed in 2012 with the movie Think Like A Man, an adaptation of Steve Harvey’s book ‘Act Like a Lady, Think Like a Man’. In 2014, she starred as Terri Granger in ‘No Good Deed’ which also earned her a BET award, as well as two ‘NAACP Image Awards. After she starred on drama series, Person of Interest, the talented actress got the role of ‘Cookie Lyon’ in musical drama series ‘Empire’ after she was hired by Fox to take up the role. She stars opposite co-star Terrence Howard in the series which hit the screens on January 7, 2015. The movie has stayed on top, with several positive reviews and recognition for its cast including Taraji .P Henson. The sizzling hot actress enjoys a deserving net worth estimated at $16 million. Taraji has made a whole lot from her acting stints and has her major appearance as Cookie Lyon in Empire to thank for her recent earnings. She also has a makeup collection which she launched in collaboration with MAC Cosmetics. Taraji P Henson was made the spokesperson of MAC Cosmetics Viva Glam Campaign in November 2016. The campaign had the objective of aiding the MAC HIV/AIDS fund, for persons living with the disease. She is also a strong supporter of People for the Ethical Treatment of Animals (PETA) which speaks for the better treatment of animals in the society. Henson has a son Marcel whom she birthed in 1994 while still in college. The actress who was in a relationship with her high school sweetheart, William Lamar Johnson took in at the time and decided to keep the baby. As a matter of fact, she could have been dropped by the school authorities but undeterred, Taraji proved that she could handle the challenges and continued with school. In 2003, Marcel’s father, Johnson was murdered. The actress was never married to her baby father. Taraji P Henson got everyone on her personal business when speculations about her relationship status flooded the media in the year 2015. This was after she and former football player Kelvin Hayden were spotted together in Miami. But being a very private person, the actress spilt no information and as a result, aroused rumors of a possible relationship between the two. But in December 2017, the Empire diva confirmed she was dating Hayden, putting an end to the sniffings. 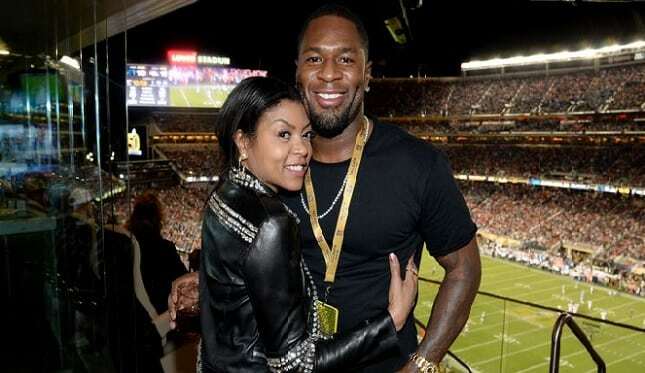 It was indeed a pleasant surprise to the public when Taraji revealed she was engaged to the former Super Bowl star. The mid part of May 2018 came with sweet news of her engagement on Mother’s Day. Sharing a photo of a diamond ring on her finger, she announced that she was engaged. This was immediately followed with an ocean of congratulatory comments from her excited fans who always looked forward to witnessing the day of her engagement.